Joel (Carrey) is a shy sort of fellow who might prefer a huddle with his pens and drawing pads to the jolts and vagaries of novel human interaction. 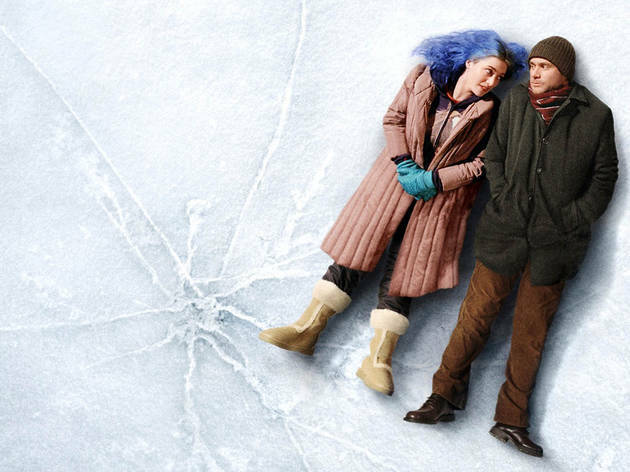 Waiting for the overland to work one wintry day, he feels an uncontrollable urge to hop a train in the opposite direction, and only thus encounters Clementine (Winslet), a blue-dyed boho who makes little distinction between her every thought and the words she speaks. His passivity attracts and antagonises her; she flummoxes him and turns him on. Counter-intuitively, they click. It's almost as if they've met before. Viewers deserve to see Gondry and screenwriter Kaufman's hilarious, love-stricken, endlessly inventive collaboration fresh for themselves - especially since the more surreal thrills hinge on an 'am I awake or dreaming' mix up, and since even the quieter passages tremble with pain and revelatory vulnerability. We won't go into too much detail about Dr Mierzwiak (Wilkinson), who runs a popular if low rent New York practice in memory-modification with a merry young staff (including Dunst, Ruffalo and Wood); or into how the film, in boldly dramatising memory and the subconscious, develops as an equally loopy and poignant companion piece to Kaufman's Being John Malkovich. Suffice to say the formidable Gondry/ Kaufman/Carrey axis works marvel after marvel in expressing the bewildering beauty and existential horror of being trapped inside one's own addled mind, and in allegorising the self-preserving amnesia of a broken but hopeful heart. Views after views, I keep on falling in love with this movie. It’s not really a comedy and is only funny in little doses. In truth, it is actually a toughly real depiction of love and relationships – from idyllic beginnings to harsh endings. The loves stories unfold in front of you, with true heart and humane affection. Respectful treated, it is both a sad and uplifting way to look at love. Would definitely recommend to give it a try.